The Cape Henlopen High School golf team began its 2007 season as usual, with a match against Caesar Rodney’s Riders on March 22. As is also usual, the Vikings lost, this time by a twelve-stroke margin, 162-174. Two things that were a bit unusual this time were that they played at Kings Creek Country Club, and the weather was quite a bit warmer than the usual cold that greets the new season. Caesar Rodney’s Devon Ripley took medallist honors with a 36 on the back nine. Cape’s Travis Parker finished one stroke back at 37, which included a double bogey on the tough par-5 twelfth hole. “[The first drive] hit the cart path and then it was up on someone’s porch,” he laughed. I watched Karsnitz’ second shot on the par-5 17th hole, where he gripped several inches below the shaft end on his hybrid. “I choked up a little more because on that hole, I didn’t want to make sure I didn’t do anything dumb, ‘cause that’s hole’s pretty easy. I choked up to get a little straighter.” It worked. 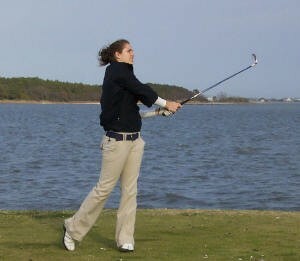 Sam Purple watches her tee shot on the bayside par-3 19th hole at Rehoboth Beach CC, playing as the 9th hole this year on the front side. Nardo played his last hole smartly. His drive went left of the left side fairway bunker, stymied by a tight stand of cedars. Nardo chipped dead right over the bunker to the middle of the fairway, hit a nice iron shot to the front of the green, and two-putted for a bogey. It that would have been much higher if he’d tried anything heroic for his second shot. The Vikings bounced back quickly the next day in a non-conference match with Delmarva Christian at Rehoboth Beach Country Club, winning 159-214. This year the front nine does not include the par-5 ninth hole, and substitutes instead the short par-3 19th hole adjacent to Rehoboth Bay. Even with par at 34, the team’s scores were impressive. Parker took medallist with his 35, and Dan Scrutchfield shot his best competitive round ever with a 6-over par 40 for second among the Vikings. “It was a lot more steady. I had three pars and the rest bogeys, except for one double. Nardo and Karsnitz both shot 42s, as did Bradley Ha, giving Coach Smarelli a choice of which golfers to use for the team’s final two scoring spots. On Monday, March 26, the team hosted Salesianum for a rare match play contest, and lost all of the matches to one of the state’s best squads. The Vikings’ scoring remained a bright spot nonetheless. Parker faced off against Colin Smith, the state’s Number 1 golfer, and lost 1-up. “He shot a 33, and I shot a 35,” Parker said. Karsnitz had a 42 in his loss, and Nardo lost to his competitor with a 43. If the event were medal play, however, Scrutchfield’s 42 would have counted toward a team total of only 156.